Google Docs Quick Create (extension) | Business Cloud Inc.
Don’t you wish there was a quick way to create a Google Doc, Sheet or Form instead of going through Google Drive first? Well, it is a good thing you looked here because there is a great extension in the Chrome Web store which allows you to create a Google Doc with a click of a button from the Chrome Browser menu. The extension is called Google Docs Quick Create and it is completely free! 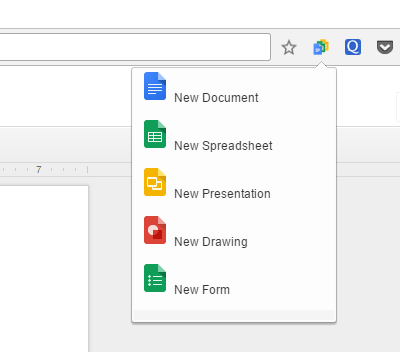 As soon as you click New Document, the file will be saved in your Google Drive account under the My Drive section. You do not even need to have it open. Check in every Friday for a new app suggestion from the Business Cloud team. "I like the unlimited training, especially since we have been adding new people. Business Cloud is amazing." "We recommend Business Cloud to everyone but our competitors." Mike and Colin Hedson NA Inc.
"I recommend Business Cloud to save money that you never knew you could." "Bottom line: They know their stuff. Their IT knowledge and expertise is second to none." Business Cloud Becomes a RingCentral Certified Delivery Partner!